We start out the week with the tepid announcement that Bike and pedestrian enhancements don’t necessarily hurt business--which is great, since so many cities are working on them this year, from Chicago, where a in the New Chicago Plan: Pedestrians Come First to Canada where the City of Montreal launches pedestrian safety campaign, while in Phoenix's Walkability Gamble Might Actually Pay Off, San Francisco rolling out plan to improve pedestrian safety, and a new Plan would make West Shore more pedestrian friendly. In other words Sidewalks -- now there's a vision. At least, in some places...they're still Running Out of Sidewalk Near Lake Murrary, and Sherman Oaks Ranks Average in the Walkability Ratings. For that matter, Austin Ranks Low in Walkability Survey. At least Bellingham Stands Out On Walkability. HC notice to State on plea to ensure pedestrian safety. Speaking of efforts to improve pedestrian safety: Police Stings for Drivers Who Don't Yield in Crosswalks: Does It Really Work? And while we're on the topic, here's some Survey Results: Are San Diego Adults Driving Distracted? (I think that was a rhetorical question). 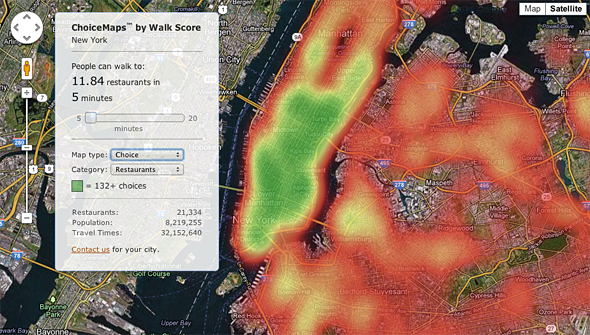 Finally, this week you can get a Sneak peek at the making of the island pedestrian walkway, or peruse ChoiceMaps: A New Way to Measure Neighborhoods from our friends at WalkScore.